Project Management Institute (PMI)® Professional Development Units (PDUs): This Webinar is eligible for 1.5 PMI® PDU in the Technical Category of the Talent Triangle. – How do we make sense of all that data? – Learn how MS Project and SharePoint 2010 provides powerful Business Intelligence (BI) capabilities to enable decision makes with the ability to transform raw data into meaningful and useful information. Learners will come away with a basic understanding of how Business Intelligence (BI) to transforms raw data into meaningful and useful information. 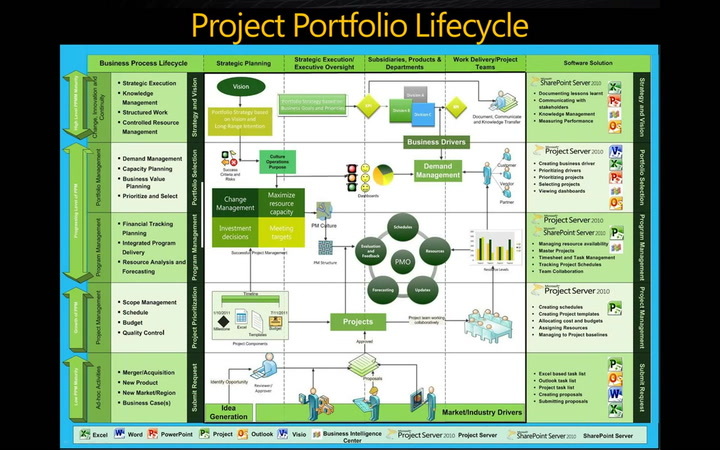 Mark Dochtermann is the co-author of Making Effective Business Decisions Using Microsoft Project. He has over 30 years of project management experience, as a certified Project Manager Professional (PMP)® and Scheduling Professional (PMI-SP)® with The Project Management Institute (PMI)®, a certified Information Security Specialist (CISSP) with the Information Systems Security Association (ISSA), and a Microsoft Certified Information Technology Professional (MCITP). During his extensive project management career, Mark has managed projects for large organizations including Amoco, IBM, Oracle, Microsoft, Kellogg’s, MCI Business Systems, the State of California Department of Child Support Services, and the 1988 Winter Olympics Organizing Committee. Mark has an extensive background in scheduling for large and complex projects, and possesses an outstanding customer-focused reputation. His extensive experience allows him to write material relevant to all levels within an organization from operations staff to senior level management. Mark is currently the Manager of Portfolio Strategy for Xerox State Healthcare, LLC. In his current role, he establishes Portfolio management strategy for the California MediCAL Management Information Systems (CA-MMIS) program. Mark is also a founding member of the Technology Member Advisory Group (TechMAG) for PMI® Global. Tim Runcie is an established author, having written over 20 books on various disciplines and technologies related to project management. As one of only a few dozen industry-recognized experts worldwide who focuses on project and portfolio management technology as a Microsoft Most Valuable Professional (MVP) in Project Server, Tim contributes an unsurpassed level of knowledge and experience to each of his books. As the President of Advisicon, Tim has over 25 years of experience in information systems and 12 years of construction project management experience. During his career he has guided organizations in successfully managing competing initiatives using scarce resources, fixed budgets and interconnected schedules. He is particularly adept at establishing project methodologies that are adopted into the project management culture of organizations and creating custom tools to expedite and automate the project management process. Tim’s true love is teaching. When not leading or mentoring organizations, he is actively involved in writing books, teaching courses, and developing training programs. To every book, course and project he brings a personal passion for education and a commitment to providing customers with a full set of skills and tools to achieve optimum success. Tim understands that successful project management adoption requires changes in organizational culture, paired with learning new skills and strategies. Enabling organizations to create their own sustainable project management culture through consultative mentorship and guidance drives Tim’s passion for sharing his expertise and teaching.